Obama closing Guantanamo? President considering autonomous action, paper reports. 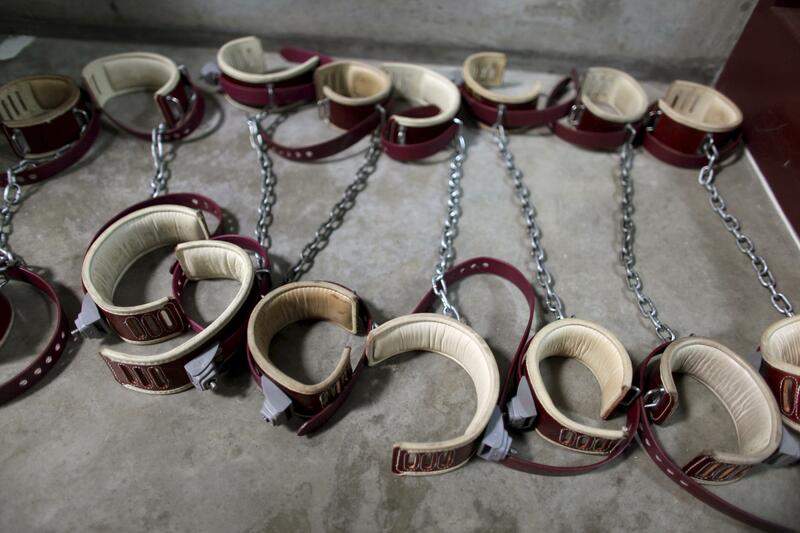 Leg shackles at Guantanamo in a photo from 2009. He could veto the annual bill setting military policy, known as the National Defense Authorization Act, in which the ban on transferring detainees to the U.S. is written. While the veto wouldn’t directly affect military funding, such a high-stakes confrontation with Congress carries significant political risks. A second option would be for Mr. Obama to sign the bill while declaring restrictions on the transfer of Guantanamo prisoners an infringement of his powers as commander in chief, as he has done previously. Presidents of both parties have used such signing statements to clarify their understanding of legislative measures or put Congress on notice that they wouldn’t comply with provisions they consider infringement of executive power. This 2013 National Journal piece notes that prisoner transfers have already lowered the Guantanamo population. Nearly 800 individuals have been held at Guantanamo in total, but the current number of detainees is only 149. A provision tucked into the latest National Defense Authorization Act…lifts transfer restrictions on detainees who have been cleared to leave and were never charged for a crime. The new rules allow them to return to their home countries or to certain other nations willing to receive them. The ease in policy clears a path for 79 detainees—half of the facility’s remaining population—to leave under monitoring or other arrangements with their new host country. And many among the other half of the remaining population are under review, which could lead to additional transfers. The cost of housing a single inmate at Guantanamo is approximately $2.7 million per year; an inmate at a “supermax” prison in America costs the government about $78,000 annually.